I have just returned from London Colney in Hertfordshire, where the Archdiocese of Westminster has its Pastoral Centre. All Saints Pastoral Centre is an impressive range of buildings in extensive grounds which, until 1973, was a convent for Anglican nuns. It has cloisters arranged round central courtyard and a sizable chapel in the gothic style designed by Sir Ninian Compar. Although the buildings were conceived on a grand scale, with elegant parlours and a spacious great hall, the bedrooms, being the former nuns' cells, are small and make few concessions to the modern age. Throughout the five days that I was there, I found the food good and the staff helpful. More than 20 priests attended with the intention learning to celebrate Mass in the usus antiquior. 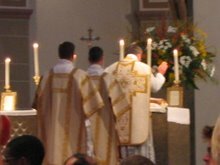 Some were beginners and studied Low Mass; others, who had attended previous conferences, studied the rubrics of Missa Cantata or Solumn Mass. Tuition was given by six experienced priests who regularly celebrate in the older form. During the course of the week, at least five priests offered their first Mass in the extraordinary form. Besides tuition in the ars celebrandi, there were spiritual lectures and a range of liturgies which were designed to be examples of best practice. These included Vespers, Compline and Benediction, as well as daily public Mass. Plainsong and polyphonic settings were provided by the Charles Finch Singers who also lead the singing of the office. Private Masses began at 6.15am and and took place at various side altars, providing plenty of early morning work for the team of servers, who were on duty later in the day at the public liturgies. 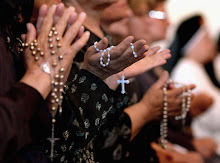 A reminder that Fr William Charlton celebrates a Mass in the traditional rite every Sunday at 6pm at the Church of St Alphonsus in North Ormsby in Middlesbrough. It is usually a Low Mass and is preceded by Rosary and Benediction at 5.30. The Mass that was formerly held twice each month at the Church of the English Martyrs in York is temporarily suspended, due to the transfer of Fr Charlton to Middlesbrough. It is hoped that it will be resumed in September. News will be posted on this site as soon as information becomes available.